You are here: Home / Raw Islam / Raw Islam 68: What Does It Take To Be a True Patriot? 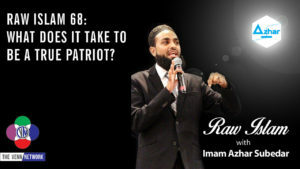 On this episode of the Raw Islam Podcast with Imam Azhar – a 2017 Podcast Award nominated podcast – we ask what it takes to be a true patriot. As this episode opens B.C. Dodge proudly introduces the Raw Islam audience to the now famous Trumpy Bear…and yes this is a real thing. Thankfully Imam Azhar quickly turns around the conversation, by issuing a dua for those that are affected by the California wild fires, which are the worst fire that the area has seen in many many years. The Imam goes on to thank those that served in the United States Armed Forces, especially those that severed in World War II – that is because this episode fell on the Tuesday after Veteran’s Day and Armistice Day. Imam Azhar does what he does best by bring the conversation home – by asking if owning this bear or wearing a red hat makes one a true patriot, or does caring about the people next to you make you a true patriot? It is America’s love for its people that makes America great, and makes someone a patriot. Not what bears they own or hat they wear.